Over the past 6 months, my little sproggy’s range of play has expanded from lying flat on her back staring at a dangly turtle whose best friend is a singing starfish (thanks baby einstein playmat!) to actually having interest in things. Obviously her choice of toys is limited by the things we buy for her, but here are the toys that she always reaches for time and time again. She is obsessed with these wooden animal shaped blocks called ‘qubes’. I bought the under the sea and farmyard themed sets a few months ago so that she could get used to holding things. They are a good size for her little hands and she enjoys playing with them. These blocks are the kind of toy that will grow with her. At first, they are excellent for practising fine motor skills. As she gets older we can learn to stack them. They can be used to learn and match colours. As her language skills develop, we will be able to identify which animals are which. Eventually the animals are perfect for some imaginative play. Hape also sell ‘qubes’ which can be laced together, again fantastic for fine motor skill development. It’s really important to me to read with her, and this is a simple way to engage her at a young age. At first, I would run her hand over the different textures in books but now she can do it for herself and finds it hilarious. The Usborne “That’s not my…” range is a favourite. As they are board books, I know that she can can’t rip the pages. Also, being at an age where everything goes to her mouth, a bit of drool won’t do too much harm. On a grosser yet equally valid note, she’s thrown up on an open one and I wiped it clean no problem! Thumbs up. The Lamaze range of toys are all very eye-catching. We have quite a few things from the range, however her top 2 would have to be the ‘Classic Discovery Book’ and ‘Sonny the Glowing Bunny’. The book is a cloth baby book. It has crinkles, a bell and a squeak hidden in the pages. Brightly coloured and textured, this has been a favourite since she could grab things. The only downside with this would be that the ring that is attache d so that it can be hung fell off! Other than that, it has been a perfect toy for her! I have to admit, I find most battery powered toys are really annoying, however Sonny is not actually that bad- in fact, he’s quite soothing. Each of his ears is split into a total of 6 tabs which can be pressed to say colours or words. His tummy lights up and he has different textures and colours on his limbs. My daughter was born at the end of October, so by Christmas she didn’t really know what was going on. This meant that we bought ‘practical’ things for her gifts but we couldn’t resist getting one toy. And the toy we bought her was an o-ball rattle. And she loves it! It’s super easy to grip. It’s flexible and lovely for chewing on. Well, I presume it is as I watch her repeatedly gnaw away at it! It’s really easy to clean, and because of it’s squishy nature, I can pop it into the change bag when we’re going out and it squeezes into a tiny space! Due to it’s many holes, it’s also easy to attach to the pram, car seat or play mat using links. This wooden stacker from Manhatten Toys looks like a regular stacker toy. The special part of it is that each disc is magnetised! So no pole running through the centre to poke little eyes out! The stacker has a rocking base, and the little bear head on top adds a cute touch. We are missing a red disc at the moment- red disc, if you are reading this please come home!! 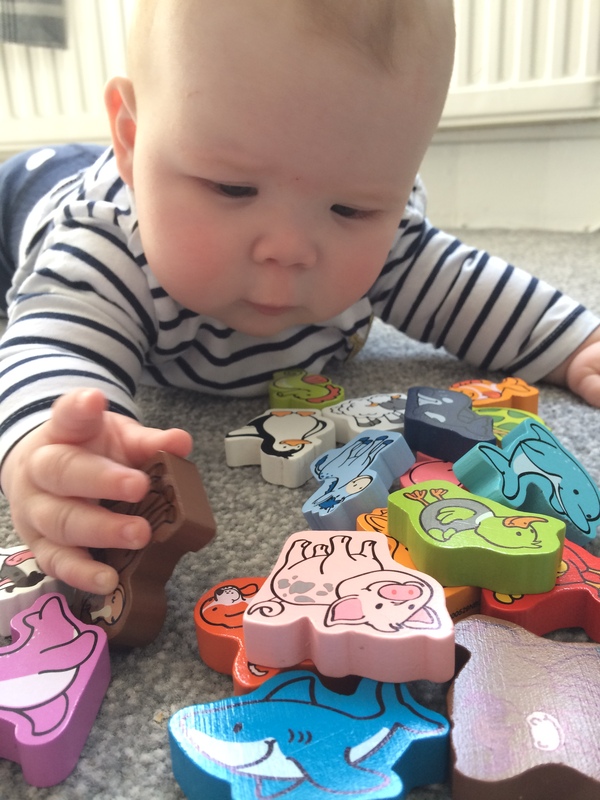 So there we have 6 tried and tested toys perfect for a 6 month old! What do your babies love to play with? Ah, great! So I have at LEAST 3 years of “that’s not my piglet!” haha! We got Dear Zoo last week and haven’t got round to it yet- so far, i love the flaps!! I’m definitely going to try “that’s not my mermaid” next! I had a unicorn adorned Bugaboo since day 1- I think the Lamaze toys having a hoop to hang them makes them ideal ‘on the go’ toys. I’m going to have to have a look at the cat! Anything crinkly is a winner in our house. Very handy when doing nappy changes as I can distract her with the wipes pack! Thanks for commenting!